Mercury with Chalk - 4 [drs] Prepared hartshorn - 2 oz Beef a-la mode Take some of the round of beef, the [being?] peice, or small round (that is generally calls the mouse buttock) cut it in five or six inches thick, cut some peices of fat bacon into long bits, take an equal quantity of beaten mace, pepper and nutmeg, with double the quantity of salt it wanted. Mix them together, dip the bacon into some vinegar (garlic vinegar, is agreeable) then into the [spice? 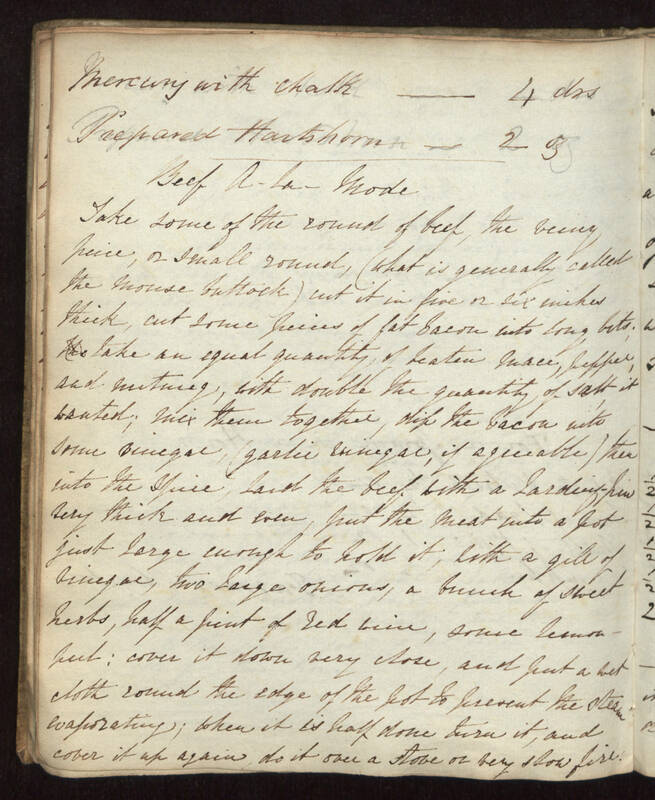 ], lard the beef with a [larding-pin?] very thick and even, put the meat into a pot just large enough to hold it, with a gill of vinegar, two large onions, a bunch of sweet herbs, half a pint of red wine, some lemon peel; cover it down very close, and put a wet cloth round the edge of the pot to prevent the steam evaporating; when it is half done turn it, and cover it up again do it over a stove or very slow fire.